We take a pleasingly roundabout route from Mantova, heading north across the plain and stopping about sixteen miles south west of Verona at the little town of Valeggio sul Mincio, set beside an old crossing of the River Mincio. It’s famous for, among other things, its tortellini – delicious pasta parcels of flavor – and for its glorious gardens, the Parco Giardino Sigurtà. Our garden visit is really thanks to Dr Carlo Sigurtà, an industrial pharmacist who visited Valeggio in 1941. He was allegedly there to buy a buggy, as he was fed up with wartime petrol restrictions, but instead purchased the remains of a ruined nineteenth-century English-style garden in the Mincio Valley. When he found it had rights to the river water, he painstakingly rebuilt its architectural conceits, box hedging and artfully-placed trees. Today it occupies almost 150 acres, the highlights of which we will enjoy on a 30-minute land train ride. With luck we should catch the last of the tree blossom as well as tulips and roses – as well as the water gardens, the gothic-style Hermitage and ‘Romeo and Juliet’s Belvedere’. To pursue the theme of young love and get us in the mood for Romeo and Juliet’s Verona, we’ll visit nearby Borghetto for a demonstration of tortellini-making, watching expert hands deftly fold dough into shapes representing the knotted golden handkerchief given by a legendary youth to his lover, a river nymph. We may have missed the annual festival when thousands of guests demolish over a ton of pasta, but we will of course tuck into tortellini for lunch, washed down with the red wines of Valpolicella - perhaps ending with sweet Amarone. We depart for the half-hour drive to Verona, checking in at the Lords of Verona Luxury Apartment Hotel on the Piazza Dei Signori, right in the heart of the historic city. After a time to freshen up, unpack and gaze out of our apartment windows over the cityscape, we will take an orientation walk, timed for that magical hour when the day cools and the Veronesi begin to emerge for the passeggiata. 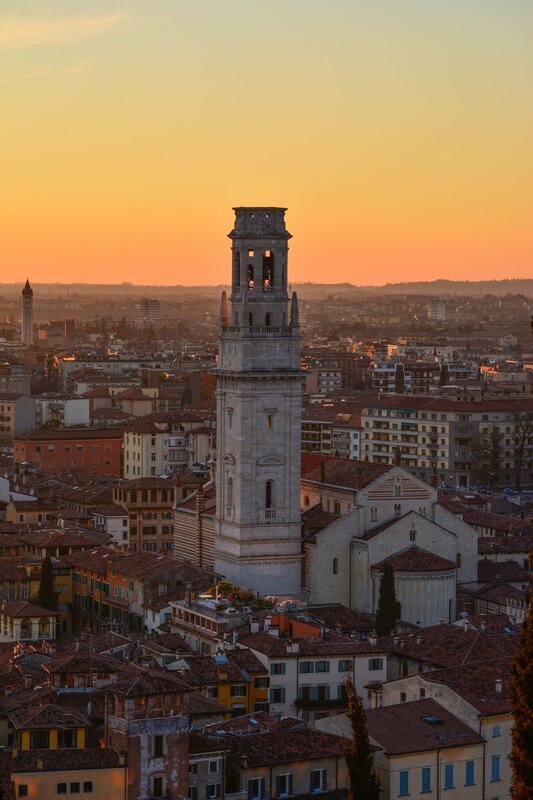 Our stroll ends back at our hotel where you will have time at leisure for exploring Verona and enjoying a pre-opera dinner. For those of you interested in Italian fashion, our hotel is positioned at the epicenter of fantastic shopping. Let it be known that your tour managers, Dana & Madi, have done some major damage shopping the June sales in Verona, and you are invited to join them on their hunt for famous labels at bargain prices! This evening, we take our top-tier seats in one of the world’s most spectacular venues, the first-century Roman amphitheater, for the Arena di Verona Opera Festival. There can be few more moving experiences than that of sitting in this mighty ellipse of brick and stone, surrounded by the many-tiered marble seating occupied by Roman audiences two thousand years ago, as the orchestra tunes up, the sky darkens and swallows zip in and out of the stones. We are lucky enough to have the best seats available for a performance of Giuseppe Verdi’s La Traviata. Please note: At the time of this trip going on sale, we are still able to guarantee seats in the Poltronissime section. Please note that we will purchase your tickets, the best seats available, at the time of your RSVP. Please RSVP as soon as possible to make sure you are not disappointed if the Opera becomes sold out. If the Opera becomes sold out, we will refund you $230 per person, the price of the tickets.